Things Are Always Better In Threes! Take your skin out for lunch with our high rolling, super boosting Sorbet Skincare products. The perfect mix for social skin that lives life at large! 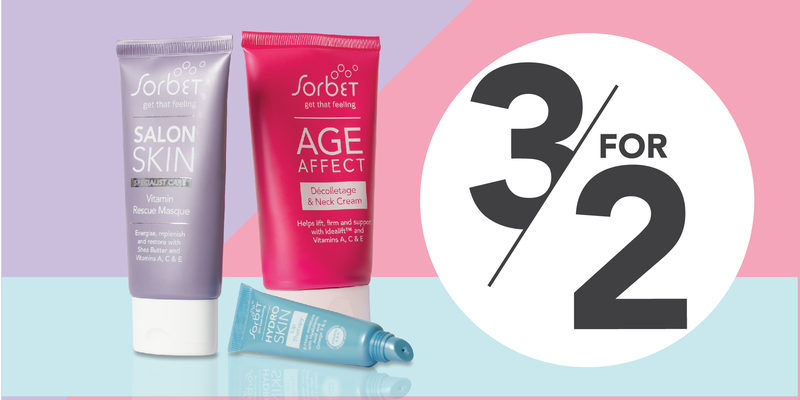 Take your pick of 3 products with Sorbet’s 3 for 2 Skincare special & get the cheapest skincare product free. * Sorbet Skincare is dermatologically approved & suited for sensitive skin. This promotion commences on September the 14th and ends on October the 15th. Our 3 for 2 specials does not run in conjunction with any other promotions running simultaneously. (Including discount vouchers) Sorbet reserves the right to cancel the promotion at any time.